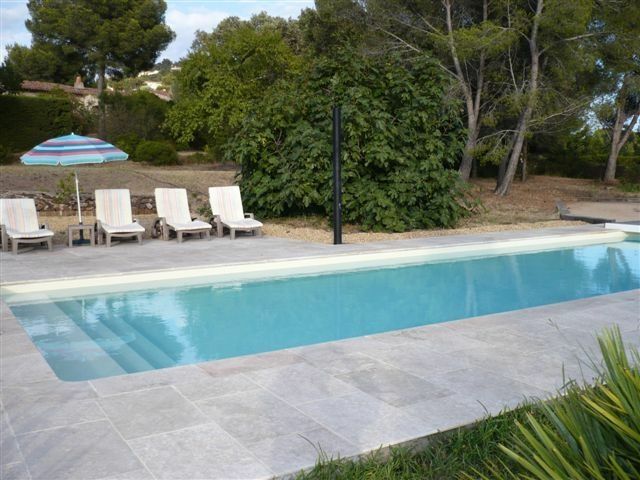 Villa Agay, quiet beaches and shops on foot, secure heated pool. Storey villa consists of 2 independent apartments T2 + T3, fully renovated in 2010. 11X4 private pool, salt electrolysis, heated from May to October, with electric shutters. Large garden 2400m2 wooded, shaded terraces, golf ball, in a quiet secure area, sea view and the red rocks of the Esterel. Access to beaches, shops and leisure facilities (tennis, sailing base) walk. Our multi-generational family from the US and Scotland, thoroughly enjoyed our 2-week stay in this well-appointed villa. Despite the weather, which was unseasonal for June and the (thoughtfully scheduled) train strikes, we were able to manage without a car for most of our trip. The children, naturally, loved the pool and made use of it thoroughly, even in the rain. Walking visits to the nearby beach, access to local small stores for provisions, the occasional bus trip to St Raphael (including its excellent market) and sorties up in the trails behind the villa made for a great holiday. An excellent choice for a family vacation. SheilaR and family, CA & KY in the US and Scotland. We thank you for your message in Abritel about our villa. We hope your way back has not been too difficult. We had a great week - very spacious villa, quiet private road, good sized pool, fantastic weather. Perfect for a 3 generation family break. Beautiful villa close to the beach, shops, sailing club and tennis. Very quiet area too! Most can be done on foot. The villa contains everything you need and is ideal for 2 families. Large garden where children are free to roam and nice size swimming pool. The area is beautiful too with lots to see and visit. Another wonderful two weeks spent in this villa. This is our second year . The villa, garden and swimming pool are huge. The owner is not here but always ready to help if required. The villa is ideally situated with shops, tennis, beach and activities all accessible on foot. The villa is in a very quiet area. We really really enjoyed our stay and wish we could stay longer. This is certainly not our last stay here. Une très grande maison très bien équipée, idéalement située, on peut tout faire à pied: courses, plage, loisirs nautiques, tennis à côté. Sur la propriété, piscine, ping pong et terrain de pétanque avec le matériel fourni.Inutile de se charger, on trouve tout sur place. Nous avons passé une semaine particulièrement agréable en famille, dans un paysage magnifique. Vacances réussies, une adresse à retenir. Nous avons passé d'excellentes vacances. Une villa très appréciable avec les deux appartements communicants pour deux familles. La piscine chauffée est un atout incontournable au mois de juin et même en plein été. La propriétaire est très sympathique et à l'écoute des vacanciers. C'est vraiment une adresse à retenir.